From the start, the set pieces catch the eye with a sharp rectangle of light through a window into a small room and a mini park in the corner. 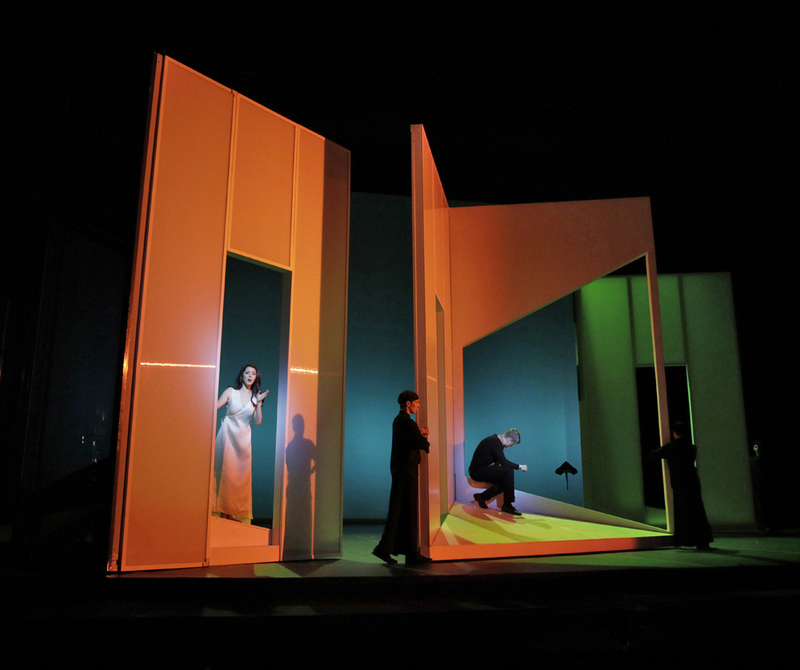 Modular set pieces on wheels are used throughout the show to their fullest potential - whether it be to change scenes quickly when they descend into the underworld, or to provide movement in the background of Maxim Mironov as Orpheus and Lisette Oropesa as Eurydice argue-singing with one another. The Furies poking arms out through painted backdrops before crawling through also provides a moment of surreal creepiness that brings you quickly out of reality and into the world of Hades. The voices of Maxim, Lisette, and Liv Redpath as Amour were all poignant and clear, the Italian words translated in projections above and to the sides of the stage. The emotions in both their singing and their expressions and acting are obvious, even when sitting on the park bench or a simple walk across the stage. The personalities of the characters of Orpheus and Eurydice were portrayed clearly- when they are going back and forth as Orpheus tries to get Eurydice to leave with them, one can’t avoid feeling the tragedy to come build with their desperation. The LA Opera Chorus directed by Grant Gershon and the LA Opera Orchestra with conductor James Conlon provide a solid foundation to anchor the performance. The stylized choreography of John Nuemeier is complemented by the beautiful costuming. A standout was the scene with Cerberus and the Furies. 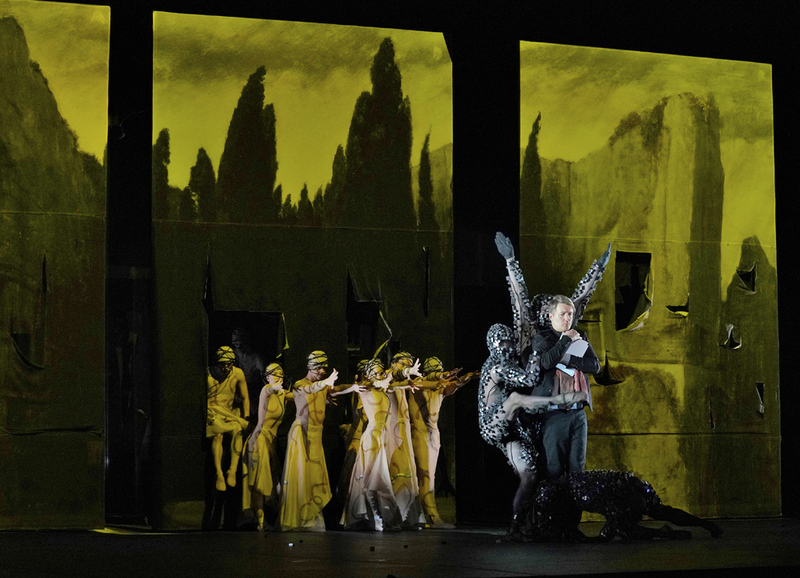 The three-headed guardian of Hades is represented with three dancers in black mesh suits covered in black cubes - as the three dancers weave through the stage and around each other like a disconcerting beast, the ethereal yet creepy mass of Furies ebb across the stage in flowing skirts and wire wrapped around their heads. This scene stood out particularly for being the most effective at weaving the dancing and opera together, and having movement and narrative purpose throughout the whole scene. The Joffrey Ballet dancers pull off the creepy, slightly inhuman vibe well, drawing you deep into this underworld setting with their exquisite dancing, culminating in a stunning dance by one of the Cerberus snaking around Orpheus in complete silence. The entire stage is used well with the movement of the set pieces to the small park set off to the side to the small slices of rooms where everything else is blocked to funnel your focus. The opera singers weave through set pieces and dancers, as the dancers too move in and out of openings and doorways and on and off stage. One drawback to the performance however is that the opera and the ballet were not very interwoven - at times, they seem like two different shows the audience is flipping back and forth from. Since most of the progression of the story happens in isolated singing sections, the large sections of just dancing have no movement narrative-wise and thus, while beautifully choreographed, can feel drawn-out and long with no purpose. One such scene is the first entrance into Elysium, where a long stretch of dancing, though pristine and elegant, goes a little too long. Its only purpose seems to be to set the perfection and peace of Elysium, but that is then explained in singing anyway, so the scene felt not only long but unnecessary to the narrative. 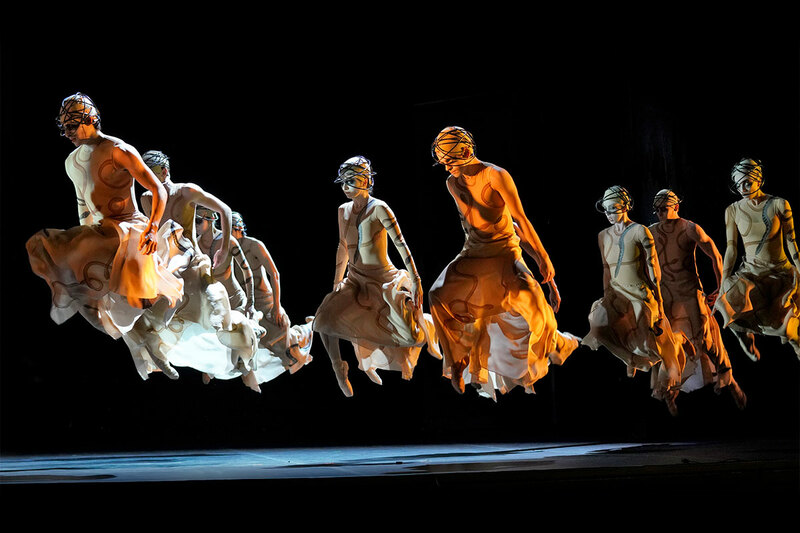 In total contrast, the first scene of a ballet company staging a new dance to the prima ballerina of Eurydice getting upset and leaving to the tragic accident that leads to her death all moves at warp speed, which makes for an odd setup for the more relaxed pace of the rest of the performance. The background movement and corps dancers bring a lot of life to the stage throughout the show. However, there were moments where the dancers were noticeably out of sync with one another. While not too often or really detrimental to the beauty of the stage, it did occasionally draw your attention. 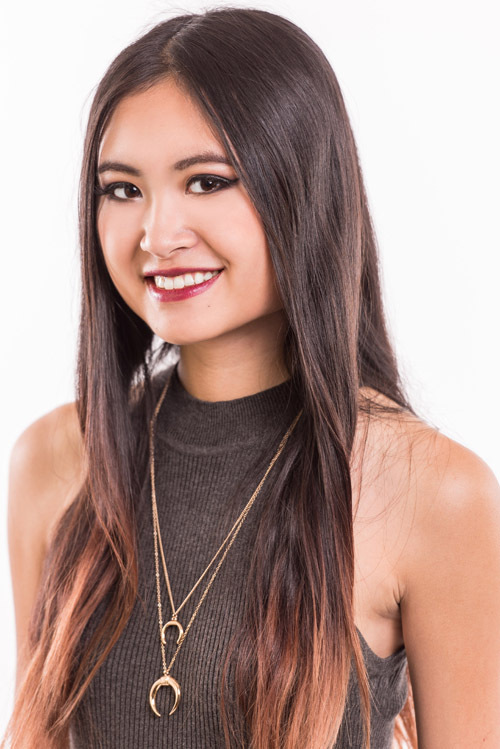 The LA Opera’s Orpheus and Eurydice with The Joffrey Ballet is a beautiful fantasy experience, bringing the old Greek myth to life in the modern era. Despite its shortcomings, the performance is a powerful combination of opera, ballet, and set and costume design that results in an ethereal performance with stunning moments.